Sheriff Acosta (Anthony Ruivivar) locks down Lakewood High and begins questioning students. Brooke is of course a total mess and in shock. Audrey and Emma try being a comfort and Audrey (Bex Taylor-Klaus) hints that maybe Jake’s texts were from the killer the whole time. The gang is all gathered in the library, and they begin discussing the possibility of the When a Stranger Calls trope; maybe the killer in “inside the house,” i.e. they locked the killer in the school. Right as that conversation reaches a fever pitch, Emma finds Jake’s phone in her backpack. Noah goes with Kieran and it turns out Kieran was packing heat. This, somehow, is a totally excusable thing to the Sheriff. Look, I’m a teacher, and I can empathize with kids… but you find a gun in a locker, the same day a dead body lands in the school auditorium and you’re like, “It’s cool son, I understand.” AYFKM!!! With Kieran now in police custody, that leaves Noah all alone in the halls and that scares me. Eli (Sean Grandillo) creeps on Emma even more, and offers to “get rid of Jake’s phone.” Before that could happen, Kieran breaks all boyfriend code, and rats out Emma to Acosta about Jake’s phone. Acosta thinks Emma or any other of the Lakewood 6 (now 5) could be the killer. So does Haley who actively calls Emma out. A huge brawl erupts in the library between them. Miss Lang (Austin Highsmith) takes Emma to calm her down, and then locks her in with a twisted grin on her face. Hmmmm… that seems more than a clue. Soon, the killer is standing outside the window of the office and Emma shatters the glass with a chair to confront them, but no one is there. They are doing a great job of making you question Emma’s sanity. All the times she’s seen the killer she’s been alone and while yes, there is actually a killer, we don’t know if Emma is the intended target or if it’s the entire Lakewood 6. Audrey is convinced Gustavo is guilty, and accidentally reveals to Noah that she’s been getting calls. Before he gets too deep into that sidebar, she goes and snatches Stavo’s tablet on which he’s been drawing the Lakewood 6 being graphically murdered. When everyone sees his drawings, another beatdown ensues until the Sheriff and deputies step in. Just then, Emma stumbles into the library bleeding. Finally, the lockdown is lifted. Emma tells the sheriff it must’ve been a panic attack. She’s lying. Noah, now curious about Audrey “borrows” her phone, and sees the texts with UNKNOWN including the security footage from the storage locker of her kneeling over Jake’s body. This was another great episode of Scream despite the lack of body count. I am a huge fan of setting horror stories in enclosed spaces, and everyone in the library for the whole episode made for some tense situations. Noah lurking the halls made me nervous that a favorite character could die. This was also Willa Fitzgerald’s best acting performance, especially the last scene with her boldfaced lying to the cops and Miss Lang. Speaking of Miss Lang, she is now the obvious suspect, but what’s her connection to Piper and the Lakewood 6? I’m hoping for some originality in that plot line. But color me excited for the Noah vs. Audrey confrontation! 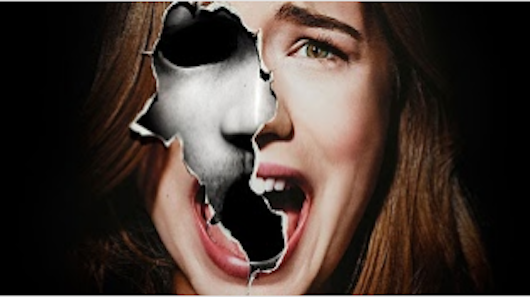 Scream returns next Tuesday night at 10:00pm ET on MTV.